I am still getting e-mail from the Democrats begging me for money. One of them is from none other than James Carville. Thought experiment: Picture Washington under total Tea Party control. Mitch McConnell will privatize Social Security. Jim DeMint will end Medicare. And kiss the EPA goodbye since Tea Partiers think clean water tramples on their constitutional right to be poisoned. The Tea Party’s like kudzu – you give ’em an inch, they take MILES. They get their crazy ideas through the House, and the Senate stops ’em. Thing is, they flip four seats, and their ideas will fly right on through. Our little thought experiment becomes an ugly-as-sin reality. What you chose to do in the next 12 hours will determine who controls the Senate – Tea Party Republicans, or the rest of us. The DSCC’s still $75,000 short of its September goal. Your immediate gift – which will be matched – could put Democrats over the top. Don’t give, and the Tea Party just got tougher to beat. Your choice, folks. This is from the man who told President Obama to panic after last week’s special election and said Obama should fire people (who?) and indict people. There are certain people in American finance who haven’t been held responsible for utterly ruining the economic fabric of our country. Demand from the attorney general a clear status of the state of investigation concerning these extraordinary injustices imposed upon the American people. I know Attorney General Eric Holder is a close friend of yours, but if his explanations aren’t good, fire him too. Demand answers to why no one has been indicted. Mr. President, people are livid. Tell people that you, too, are angry and sickened by the irresponsible actions on Wall Street that caused so much suffering. Do not accept excuses. Demand action now. In other words, don’t worry if any actual crimes have been committed. Just indict people to help with your reelection. As I watch the Republican debates, I realize that we are on the brink of a crazy person running our nation. I sit in front of the television and shudder at the thought of one of these creationism-loving, global-warming-denying, immigration-bashing, Social-Security-cutting, clean-air-hating, mortality-fascinated, Wall-Street-protecting Republicans running my country. The course we are on is not working. The hour is late, and the need is great. Fire. Indict. Fight. I don’t think the crazy person is in the Republican debates, except for Ron Paul. Frankly, getting federal spending under control and getting the EPA off our backs sounds a whole lot saner than what the Democrats are doing, spending us into bankruptcy. As for James Carville, I think his wife, Mary Matalin, should make sure he is taking his meds. 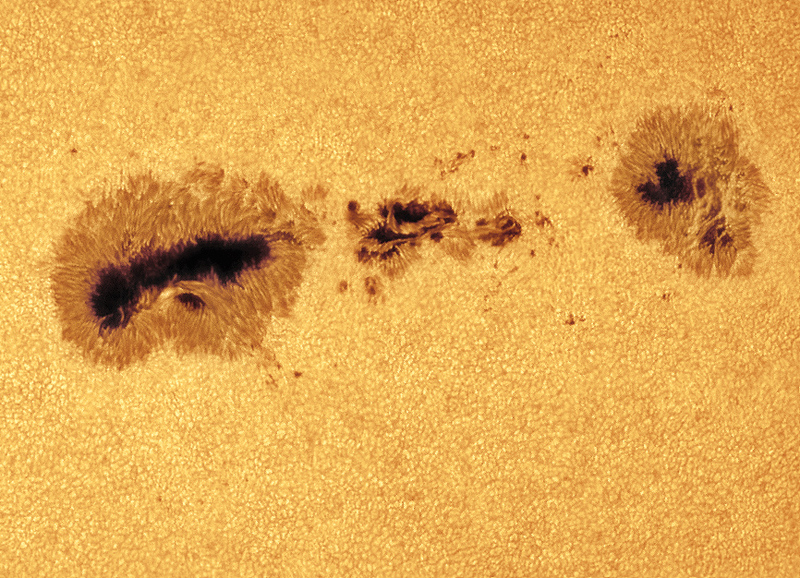 There are some pictures of the active region at discovermagazine.com as well as some information here and here. I hope they don’t mind if I use this picture, but I thought it was interesting. 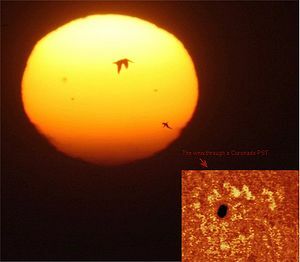 See how small the Earth is compared to a sunspot. Here is a picture of the whole region. That region is pretty feisty, and the odds of us getting more flares from those spots are pretty good. The Sun’s rotation is currently taking them toward the center of the disk, where a good sized explosion is then directed toward us, and particle waves from the blast can then interact more efficiently with our magnetic field. We may be getting aurorae from them, and if things go well that’s all we’ll get! A big blast can damage satellites, and even put astronauts on the ISS at risk. We on the ground are pretty safe, since the Earth’s air absorbs the radiation — that’s why we have to launch satellites like SDO into space, so they can detect that energy in the first place! However, a big blast can shake the Earth’s magnetic field, inducing a current in the ground that can actually overload power lines. We can get blackouts from such things, and it’s happened before. This is a real problem that can do millions or even billions of dollars of infrastructure damage (including money in the economy lost during the blackout). I know a lot of solar physicists are concerned about this eventuality, and are trying to get both the power companies and the government to take it seriously. I hope they do. We’re still approaching the peak of the solar cycle sometime in mid-2013 or so, and flares like the one Saturday will most likely be more common. Although, I am actually glad the Sun is getting more active. There were practically no sunspots during the period known as the Maunder Minimum, from 1645-1715, which coincided with the Little Ice Age. This last solar cycle, the Sun seemed to be a little too quiet and there was some speculation that we might be entering into another minimum. Here is a chart of sunspot activity over the last few centuries. It is probably a better indicator of global climate changes than human carbon emissions, but don’t tell Al Gore that. Today is Rosh Hashanah, the Jewish New Year and the first of the High Holy Days. To be more precise, Rosh Hashanah actually began yesterday evening, since the Jews have traditionally begun a new day at sunset. This holiday takes place on the first two days of the month of Tishrei in the Hebrew calender. Because the Hebrew calendar is a lunar calendar, the dates wander a bit in our Gregorian calendar. This year it takes place on September 28-30. The New Year is celebrated for two days because of the difficulty of determining the precise day of the new moon. Rosh Hashanah, which means “the head of the year”, is not mentioned as such in the Bible. Instead the day is called “Zikaron Teru’ah” a memorial of the blowing of horns in Leviticus 23:24 and “Yom Teru’ah” the day of blowing the horn in Numbers 23:9. I mentioned that the Hebrew calendar is a lunar calendar. That is not quite correct. A fully lunar calendar would be based solely on the phases of the moon would cycle through the year, as the Islamic Calender does. Instead, the Hebrew calendar is a lunisolar calendar. The twelve months add up to 354 days, so to keep up with the seasons extra, intercalary months are added in a nineteen year cycle. Seven intercalary months are added during the cycle so that a thirteenth month is added every two or three years. This means that the dates wander a bit compared to the Gregorian calendar but stay within the appropriate seasons. I spent the afternoon, after work, in the process of buying a new/used car. Normally, I would rather have root canal work without anesthesia than go through this process, but the dealership I went to made the experience barely tolerable. In any case, we bought a black 2008 Honda Civic to replace my old black 1998 Honda Civic. From the Daily Mail. This could be bad. A sunspot, 62,000 miles across – so big it would dwarf the Earth – is releasing gigantic solar flares that could in theory wreak havoc with electrical communications ranging from handheld electronics such as iPhones to sections of the power grid. Nasa has detected two X-class solar eruptions from 1302 – the most extreme possible – in the past week. One that occurred on September 24 produced an amazing light show over England last night – but it’s far from over, as the sunspot isn’t yet directly aligned with Earth. NASA experts have said ‘anything electrical’ can be affected by such activity. Known as ‘Active Region 1302’, it is producing bursts of radiation so intense that spectacular auroras, caused by the sun’s particles hitting the atmosphere, have been seen as far south as Oxfordshire. Astronomer Dr Ian Griffin, CEO of Science Oxford, told MailOnline: ‘Active Region 1302 is the source of all of the auroras seen yesterday, and may well be the source of some more auroras over the next few nights. The last really bad solar storm we experienced was way back in 1859. Telegraph systems all over Europe and North America failed, in some cases even shocking telegraph operators.Telegraph pylons threw sparks and telegraph paper spontaneously caught fire. Some telegraph systems appeared to continue to send and receive messages despite having been disconnected from their power supplies. Just think of the havoc a storm like that could wreak today with all the electronics that we depend upon. This could be the end of civilization. 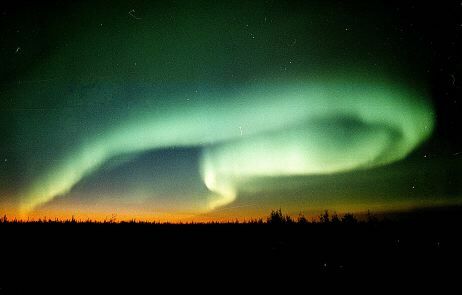 On the other hand, I’ve never seen the Northern Lights before. It would be really cool to see them as far south as Indiana. I am still getting e-mail from prominent Democrats begging me to contribute.Evidently, in three days, they have to file with the FEC and they hope to get good numbers. This time I got an e-mail from none other than Nancy Pelosi, the former Speaker of the House. For the third time in 10 months, House Republicans pushed our government to the brink of a shutdown to put their radical agenda ahead of the American people’s interests. While Democrats worked to secure disaster relief funding, House Republicans insisted on holding these critical funds hostage in a cynical ploy to advance their agenda. It’s never been clearer why we need a Democratic House Majority. We cannot afford another two years with a Republican Majority that recklessly brings us to the brink of a government shutdown unless their radical ideological demands are met. Friday’s FEC filing deadline is only 72 hours away and we are still $171,984 away from our $1 Million grassroots goal. It is critical that we have a powerful showing of grassroots strength. I am not sure that the representative from the Congressional district that includes most of San Francisco is in much of a position to say what is extreme or radical. They do seem to be increasingly desperate though. I wonder how their overall fundraising is going. That’s what this clown wants Obama to do. Obama told Edwards, a major donor to Democrats over the past decade, that he wanted to take tax rates back to the rates in the 1990s. Somehow the fact that he is a major donor to the Democrats does not surprise me. You can see the video here. They won’t let me embed it. But, of course, this isn’t about his taxes. It’s about raising taxes on the rest of us. In an article in the Wall Street Journal, physicist Michio Kaku has something interesting to say about the recent experiments at CERN in which neutrinos seemed to have traveled faster than light. The CERN announcement was electrifying. Some physicists burst out with glee, because it meant that the door was opening to new physics (and more Nobel Prizes). New, daring theories would need to be proposed to explain this result. Others broke out in a cold sweat, realizing that the entire foundation of modern physics might have to be revised. Every textbook would have to be rewritten, every experiment recalibrated. Cosmology, the very way we think of space, would be forever altered. The distance to the stars and galaxies and the age of the universe (13.7 billion years) would be thrown in doubt. Even the expanding universe theory, the Big Bang theory, and black holes would have to be re-examined. Moreover, everything we think we understand about nuclear physics would need to be reassessed. Every school kid knows Einstein’s famous equation E=MC2, where a small amount of mass M can create a vast amount of energy E, because the speed of light C squared is such a huge number. But if C is off, it means that all nuclear physics has to be recalibrated. Nuclear weapons, nuclear medicine and radioactive dating would be affected because all nuclear reactions are based on Einstein’s relation between matter and energy. If all this wasn’t bad enough, it would also mean that the fundamental principles of physics are incorrect. Modern physics is based on two theories, relativity and the quantum theory, so half of modern physics would have to be replaced by a new theory. My own field, string theory, is no exception. Personally, I would have to revise all my theories because relativity is built into string theory from the very beginning. In other words, much of what we think we know about the universe is about as accurate as views of the people back in the middle ages who believed that the Earth was the center of the universe and everything was made up of the four elements; earth, fire, air and water. Of course, the most likely outcome is that the findings at CERN are erroneous. Kaku ends his piece by declaring this to be a victory for science however it turns out. Reputations may rise and fall. But in the end, this is a victory for science. No theory is carved in stone. Science is merciless when it comes to testing all theories over and over, at any time, in any place. Unlike religion or politics, science is ultimately decided by experiments, done repeatedly in every form. There are no sacred cows. In science, 100 authorities count for nothing. Experiment counts for everything. So, if a theory as well established as Einstein’s Theories of Relativity can be cast into doubt, what does this say about hypotheses regarding global warming, which are based on very incomplete understandings of the Earth’s atmosphere? I want everyone out there who believes that global warming/climate change/ climate catastrophe is settled science to repeat after me one hundred times. The science is never settled. You can find Michio Kaku’s books here. Barack Obama is looking more and more like the second coming of Jimmy Carter. Can an embassy takeover be next? From Fars News Agency comes a report that suggest youths in Egypt are thinking along those lines. According to a report by Palestine al-Yawm (Palestine Today) news network, the young Egyptians have posted a request on their Facebook webpage and blasted Barack Obama’s speech after his presidency in Cairo in which the US President pledged a new approach towards Muslims. They said that the threat by the Obama administration to veto the Palestinian bid for UN membership revealed the realities about Obama and the fact they “he is a liar and is no different with his predecessors in supporting Israel and blatant violation of the Arab nations’ rights”. The Egyptian youths said the attack on the US embassy would serve as a strong message in response to the US hegemonic policies. They further warned the US to refrain from vetoing the Palestinian bid, saying that such a move by the US would encourage violence in the world. I start to wonder what move by the US wouldn’t encourage violence with these people. I like this paragraph at the end. Palestinians stress that they have never gained anything through talks with the Zionist regime, mentioning that negotiation with the racist regime is a waste of time and gives the Zionists the chance to push their settlement construction plans ahead and come along with their international and internal problems. Well, maybe negotiations with the Zionist regime might be a little more fruitful if the Palestinians acknowledged that the State of Israel has a right to exist. It is just a little hard to talk with people who want to exterminate you. Anyway, I wonder if President Ahmadinejad is back in Iran yet. If not, maybe he could stop by Cairo and give these youths some tips on the embassy takeover business.